Above is the per share dividend growth for Procter & Gamble over the past 60 years. 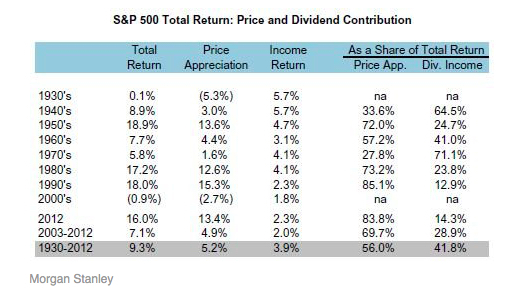 As financial farmers, it is imperative we consider the impact of dividends on a financial farm; indeed, dividends have historically accounted for 42% of a portfolio's return! Much of Wall Street is laser-focused on obtaining Alpha (positive returns), yet you rarely hear the "fast money" discussing boring dividends. Or Yield on Cost. Or the Dogs of the Dow. Boring doesn't make for flashy news, but it sure does make for a fat stack of benjis on your farm! Don't underestimate the true goal of investing: cash flow.